This robe. 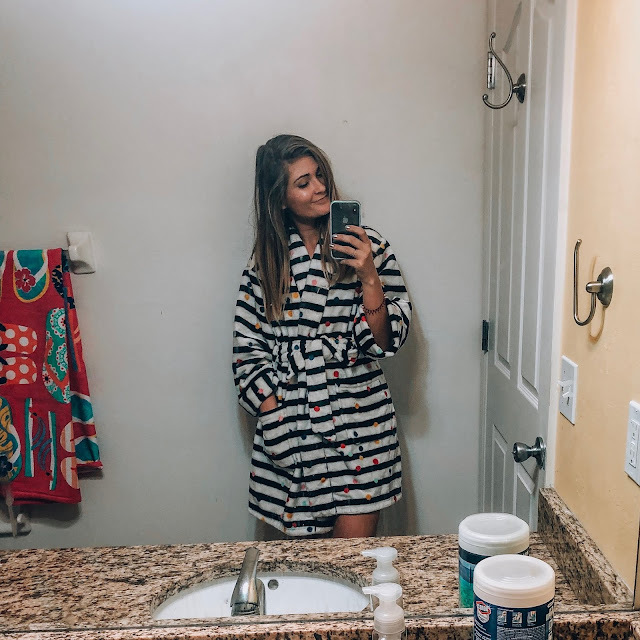 || My mom got me this Kate Spade robe for Christmas and it is, quite honestly, the new love of my life. Simple Habit app. || While this isn't a January discovery, I used this almost daily in January. It's been so helpful to me, and if you struggle with quieting your mind, I highly recommend it. This pitcher with a strainer. || If you love infusing your water with fruit and herbs but don't like getting the occasional chunk of mint or lemon when you're drinking it, this is for you. It's the cutest little glass jar (that makes me feel so fancy) and the lid has a built in strainer. So put whatever you want in the jar, but only liquid is coming out. It's so good! Skincare fridge. || I got a tiny pink fridge to start keeping my skincare stuff (and eye masks) in, and it's the most extra thing I've ever done. I LOVE IT. Just gonna level with you, this was 50% off when I got it. It's now listed at $72, which is a bummer, but here are some cheaper options: this one is $30 and this one is $37. Impress nails. || You're going to think I'm crazy, but I have to tell you something: I'm a stick-on nails convert now. It sounds ridiculous, but I've been wearing $6 press on nails and they look better than my nails look when I get them dipped (or even gel). They last 5-7ish days, which is about how long anything else lasts on my nails. Grab some next time you're at Target and just give them a go. Depending on the style, some of them are a little off if you look toooo close, but hey, $6...I'll take it. Fabric shaver. || I got this for my Poshmark ventures and after seeing how new it makes clothes look, I immediately took it for a spin in my own closet. You know how you have some clothes that you've had for so long or have washed so many times, the fabric starts pilling up in little balls? This takes care of it for less that $10. Fabric steamer. || Also originally for Poshmark, this has changed my life. Whenever something is wrinkled, I toss it in the dryer. Which means if something I'm trying to avoid shrinking is wrinkled, I'm out of luck. NO MORE. This is magic. It also makes me feel like an adult who has her life together, which is an illusion I am super here for.